I’ve always dreamed big when viewing myself as a do-it-yourselfer. Even as a college student, long before the Internet, I culled pictures from magazines, copied instructions from books and planned for all the fabulous ways I could incorporate these ideas into my life. I still have the notebook, and I am still dreaming big. Perhaps, though, it’s time to wake up. Several years ago, during a day off from work, I decided to convert a coat closet into a pantry. How hard could that be? I’d watched it being done many times on HGTV and I even had books to guide me through the project. The pantry was part of a back-door-entry makeover, inspired by home décor guru Christopher Lowell’s television show Interior Motives and his principle of seven layers of design. At least that was my intention. I may have skipped a layer or six. The process involved nailing pieces of wood to the closet’s side walls as shelf supports then placing the shelves on top of them. My plan was that if I started early in the morning, I would have a new and improved pantry ready for action by dinnertime. I was distracted from the start. After emptying the closet of our coats and winter items, I surveyed the area for an alternate location. That’s when I spied a 3-foot span of empty wall, lodged between the backdoor and the kitchen entry, begging for a coat rack. I could make a coat rack, too, as I was sure I must have seen Christopher do it at some point. I never missed Christopher’s show, rearranging my work schedule around his genius. I measured the wall, calculated the number of hooks I could install and added the supplies to my shopping list. It would look so pretty, and wouldn’t take much doing, just a length of scrap wood topped by a wonderful piece of molding, both painted a glossy white and outfitted with five large brass hooks. Christopher used moldings all the time. Below that I would place a bench, culled from the garage and topped with a cushion in room-coordinated fabric. Christopher used loads of fabric and sewed everything right on the air in no time at all. I added black paint to my list (didn’t I hear somewhere that every room should have something black?) and guesstimated the amount of fabric, piping and foam for the cushion. The list grew. I went to Home Depot and asked for a 1×2 for the shelf supports. “What kind do you want?” the salesperson asked. “But what kind of 1×2?” he insisted. The salesperson patiently explained the intricacies of choosing a 1×2. I explained the project, bought the materials and a mitering box and saw, but decided to skip the coat rack for the time being. My ego wasn’t ready to face a discussion on how to attach the molding to the scrap lumber. Plus, I secretly worried the salesperson would ask me what kind of molding. By noon, I was ready to take on the world, or at least the closet. Christopher transformed his rooms without even changing into work clothes, though I had an apron nearby for painting. But first, I ate lunch. I needed some fuel for the job. While not schooled in woodworking, I knew enough to measure twice and cut once, so I did. Eight pieces of wood were ready to be nailed as supports. I envisioned everything dropping into place, especially since I had planned ahead and purchased a label maker on eBay so that everyone in my family could return items to their designated places. Locating cleaning supplies, pet articles and small household items would no longer be part of a frustrating game of hide-and-seek. It felt so good to be so handy. Because even I knew straight lines mattered in this kind of work, I marked the intended support placement lines with a level. It took me 10 minutes to do the first side, but 45 minutes to do the second side as I had to determine how to assure both sides measured the same distance from the floor. I didn’t count the 25 minutes it took me to locate the yardstick. I held the first support to the wall, grabbed a nail and hammered it in. The nail bent before the tip could make it through the wood and into the wall. I tried another, with more success, but when I gave a tug to assure the support’s stability, the damn thing pulled right out of the wall. I’d forgotten to nail into the studs. I quickly located them as an existing upper shelf had already been installed using this method. I followed suit in placing the nails, but they still bent as I hammered. Maybe Christopher used a nail gun. So instead, I turned to screws, only stripping three or four. By mid-afternoon, the supports were in place and I set to work cutting the shelves. In retrospect, I should have had them cut at the store, but that would have meant bringing the measurements with me, which, of course, I did not do. The sawing was hard and frustrating work. I chided myself for not paying more attention to how Christopher cut wood, as my shelving lumber did not fit neatly, or at all, into the miter box. I cussed, I cried and I swore never to attempt another do-it-yourself project. After an hour of sawing, I had four shelves with jagged edges. It was time to paint, but first I had a snack. No sense in ruining a good cup of coffee and a scone with paint fumes. My teenagers came home from school midway through the closet’s first coat. “Who wants to help me paint?” I asked in my best enticing mom voice. Backpacks dropped, the refrigerator opened, bathroom doors closed and the kids asked what we were having for dinner. I gritted my teeth and glared at their retreating backs. I opened the refrigerator and poured myself a giant glass of chocolate milk, went to the bathroom and waited for the first coat of paint to dry. I then smoothly applied the second coat. 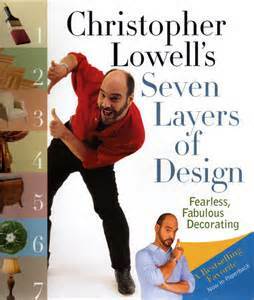 Christopher designates layer one of the seven layers of design as paint and architecture. With this part finished, I was well on my way. My husband, Scott, arrived home and examined the project. He gently asked about the uneven shelf cuts, the paint on the floor and the pile of winter items blocking the path to the laundry area. However, he had never watched Christopher Lowell and knew less about do-it-yourself than I did. We are both offspring of urban parents who grew up in flats and apartments, not on farms. Do-it-yourself might have involved hanging a picture or tightening a screw somewhere. For everything else, we called in the experts. Our learning curve was a flat line. Together, Scott and I lifted the first shelf onto its support. Like manna from heaven, it was a joy to behold. The jagged edges butted up against the wall, so they didn’t show. The shelf fit smoothly and was level. Three more shelves to simply drop into place and perhaps we’d go out to dinner to celebrate my do-it-yourself success. The second shelf fit, but snugly, requiring a bit of force to lock it into place. The third shelf was too long, settling in at an angle. I stared in disbelief, yelled at the shelf, and then grabbed a hammer to knock the stupid thing into submission. I channeled Cinderella’s stepsisters, determined to force the shelf into its supports like a big foot into a tiny glass slipper. Scott pried the hammer from my grasp. He ordered a pizza for dinner and banned me from the room—from my own project. Then he spent the next hour trimming the last two shelves and finished my project for me. I went off to sulk. Everything Christopher did worked the first time without a hitch. How the hell could I have been so misled? Over the next few days, I filled the shelves, labeling baskets and boxes. It didn’t look half bad. I made the coat rack and a bench cushion, both of which had a definite homemade essence about them. Recently, I watched Christopher create a partial bed canopy, which would look great over the basement sleeper sofa, giving it a more finished look. I wondered what kind of wood I needed for that . . .
Heidi Griminger Blanke, Ph.D. regularly writes feature articles for regional Wisconsin magazines. 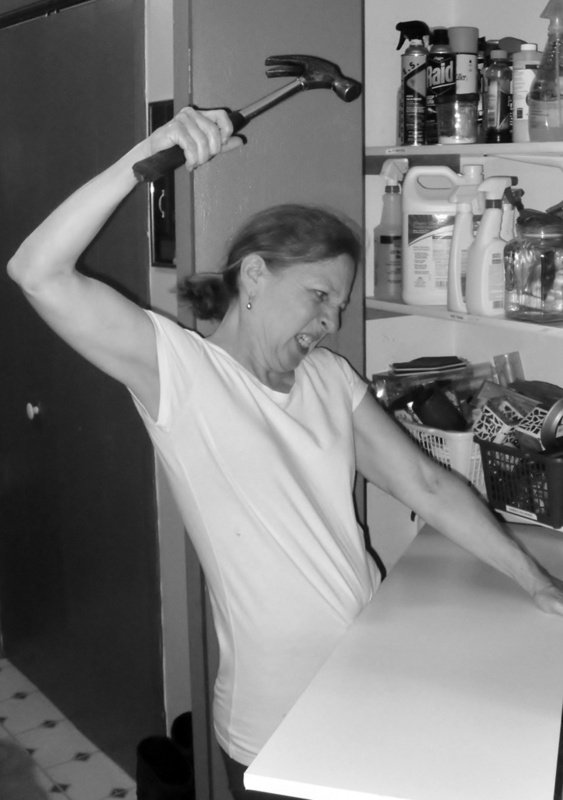 Her essay “Maybe Next December” was included in the anthology Dumped, Stories of Women Unfriending Women and her essay titled “Which Way to Rip a Seam” was published in Threads Magazine. She frequently donates her writing skills to nonprofit organizations. 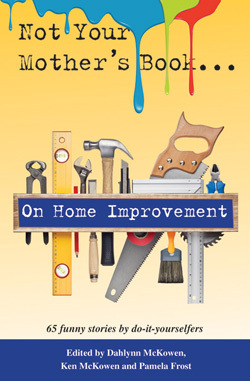 Again, this story appears in “Not Your Mother’s Book…On Home Improvement.” The book is filled with 65 very funny stories by do-it-yourselfers. Purchase this book today from your favorite retailer, Amazon (http://amzn.to/Hm66pb) or Barnes & Noble (http://bit.ly/1w5gLvO). This was as fun to read as it was well written, and it served as a great reminder as to why I don’t do home projects.